The property is nicely set back off the road providing a large gravel driveway with ample parking. On entering the hallway gives access to the bay fronted reception room with feature fireplace and stairs to the first floor. Moving to the rear of the property you find the spacious LIGHT and BRIGHT open plan kitchen/living/dining room benefitting from patio doors leading to the rear garden. The fully fitted kitchen offers ample eye and base level units, integrated appliances, space for a large free standing fridge freezer and double range oven. The ground floor benefits from wood flooring throughout, under stair storage and a cloakroom with WC. Moving the first floor, the landing provides access to the FOUR bedrooms, family bathroom and provides access to the fully boarded loft. There are three DOUBLE Bedrooms and a good size single with the master bedroom enjoying a fully fitted en suite shower room. The family bathroom comprises of a white three piece suite with shower over the bath. Externally, the private rear garden is mainly laid to lawn with paved patio area ideal for entertaining. There is a double brick garage with power and lighting with rear access and an extra parking space. To the front is a large gravel driveway with ample parking and side gated access. 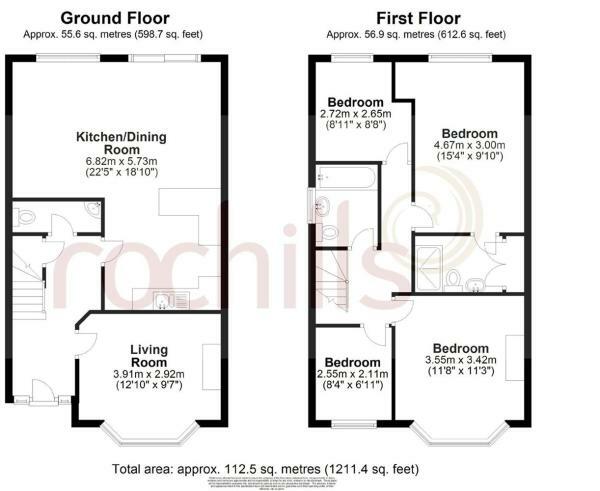 Disclaimer - Property reference 4727630. The information displayed about this property comprises a property advertisement. Rightmove.co.uk makes no warranty as to the accuracy or completeness of the advertisement or any linked or associated information, and Rightmove has no control over the content. This property advertisement does not constitute property particulars. The information is provided and maintained by Rochills Ltd, Walton-On-Thames. Please contact the selling agent or developer directly to obtain any information which may be available under the terms of The Energy Performance of Buildings (Certificates and Inspections) (England and Wales) Regulations 2007 or the Home Report if in relation to a residential property in Scotland.